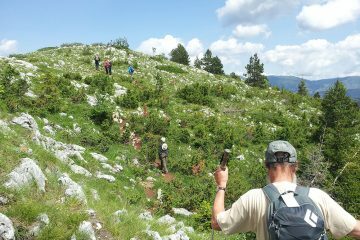 Self guided hiking tour from Southern Carinthia to Snovik. 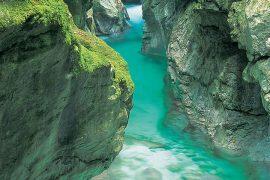 Austria / Slovenia: Individual hiking tour from place to place in two countries! During this hiking tour you will experience the scenic diversity of this delightful border region! From Carinthia in Austria’s sunny south you will hike over the mountain range of the Karawanks to the neighbouring Slovenia and its Logar Valley in the Kamnik Alps. Your starting point will be the small town Diex which lies at the foot of the central mountain range called Saualpe. 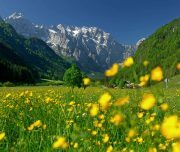 From there you will hike pass meadows, forests and farms to the “balcony” of Carinthia which offers magnificent views of the Karawanks. At Klopeiner See you will discover an alpine landscape rich with lakes, forests and moors. 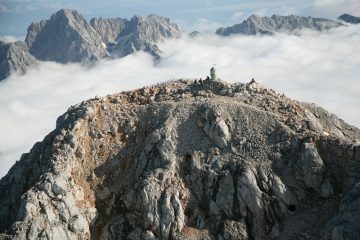 You will cross the mountain pass and reach the alpine pearl – Slovenia. 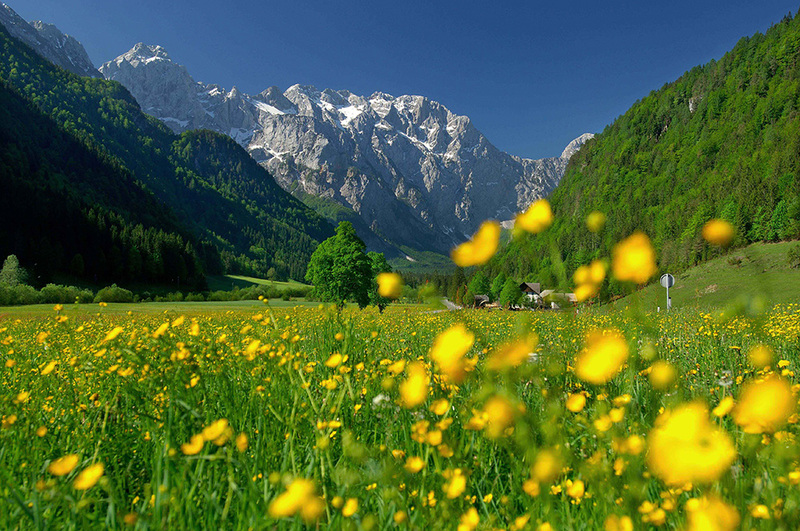 In the idyllic Logar Valley you will enjoy the spectacular alpine world of the Kamnik – Savinja Alps. Usually the guests stay in the following hotels: in Diex in the 4-star Hotel Jesch with spa, in Seelach in the 4-star Hotel Marko with spa and beach, on day 5, 6 and 7 in traditional tourist eco-farms with simple but comfortable rooms. You arrive by car to Diex, where you have free hotel parking. In the end you can take a taxi to Ljubljana (about 25 euros) and a train to Klagenfurt. Alternatively, you can use transfer Snovik – Diex for 65 euros per person (at least 2 persons.) You pay on the spot. Please book! 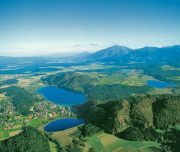 You arrive by train to Klagenfurt and take the bus to Völkermarkt (Mon – Sat), then a taxi to Diex (approximately 35 euros). In the end you can take a taxi to Ljubljana and back. You fly to Klagenfurt. 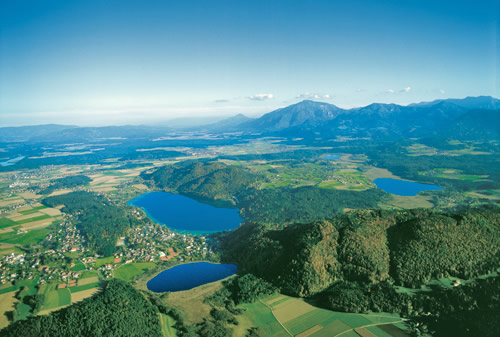 In the end you can take a taxi to Ljubljana and back or continue by train to Klagenfurt and back. Difficulty: Moderate hiking. Climbs from 100 to 640 m, 840 m on the 5th day, descents from 210 to 795 m. A few short and steep ascents and descents. Slip resistant equipment is required. DEPARTURE TIME Daily. Please contact us for details. RETURN TIME Agency can provide shuttle from hotel in Eco Spa Snovik to starting point in Diex or other destination. Please contact us for details. Surcharge for a single room: 80 EUR. Surcharge for a single person traveling: 105 EUR. Additional nights can be booked anywhere. Please let us know at the time of booking. 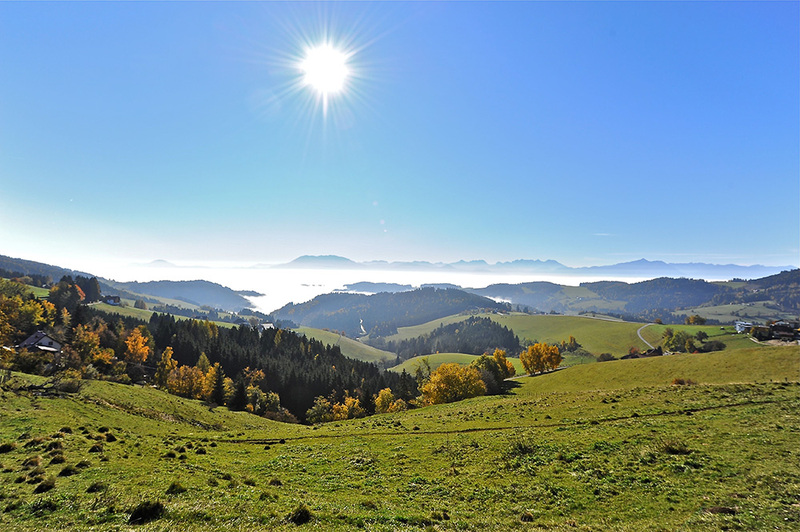 You will hike on a mountain ridge with superb views over the hilly landscape of the Saualpe and all the way up to the main peaks of the Karawanks. Numerous roadside crosses, shrines and the defiant fortified church of Diex will accompany you along the way. (Tour duration: 3 1/2 or 5 hrs.). You will have an organized transfer to Eberndorf which boasts an impressive courtyard and a beautiful monastery church. Your hike will lead you to the nature reserve of Sablatnigmoores, where you can observe numerous water birds. Pass the Turnersee, where you can also swim, the trail will lead you to Kitzelberg, a mountain with beautiful views. Your goal will be Seelach by Klopeiner See. (2 nights, Tour Duration: 4 hrs.). A shorter round tour will take you to Klopeiner See. 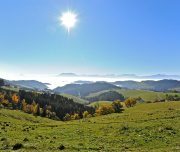 You can also hike to the ridge Gracarca with traces of prehistoric and medieval settlement and to the Georgiberg mountain with views of the foothills of the Alps. 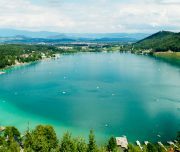 After the hike, you can swim in Klopeiner See, the warmest lake in Austria. (Tour duration: 3 ½ hrs.). On this day, an organized transfer will take you to the Karawanks. You will hike through the small gorge of Kupitzklamm and finally, on the Holy Spirit Saddle (1,434 m), reach the Karawanks main ridge. There you will cross the border and enter Slovenia. 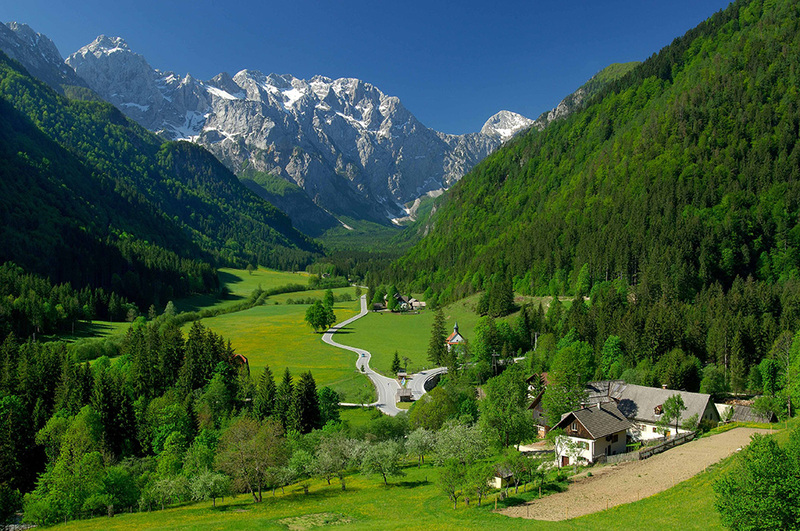 You will spend the night at Solčavsko on the highest tourist farm in Slovenia (1250 m). Detour to a karst mountain cave is also possible. (Tour duration: 3 1/2 or 4 1/2 hrs.). Pass the picturesque front of the Church of the Holy Spirit, you will first walk along the slope with great views of the peaks of the Kamnik Alps. 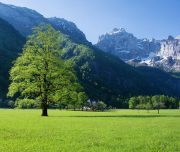 After your descent, the route will take you to your accommodation through the green Logar Valley which is surrounded by the towering rock walls. You can extend the hike to one of the huts in the valley or to the Rinka Waterfall. (Tour duration: 2 1/2 – 5 hrs.). 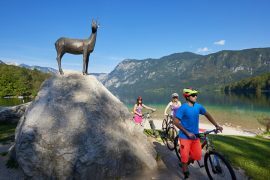 You can start additional tour directly from your accommodation or have a rest, or even visit some of the best spa facilities in Slovenian Alps at Hotel Plesnik. Return from Logar Valley Landscape Park.